Courtesy Photo Researchers working to understand EVL protein’s role in breast cancer. Organizations, nonprofits and various teams of researchers throughout the world are dedicated to seeking cancer cures. In the United States, 12 percent of all women deal with this disease in their lifetime. The University of Arizona Cancer Center is one such institution. Here's a roundup of their most recent efforts. Evil Proteins Turn Good. Roughly 80 percent of all breast cancers are "estrogen receptor-positive," meaning the cancer's growth is fueled by estrogen. Dr. Marco Padilla-Rodriguez, a recent graduate of UA's Program in Molecular Medicine, is studying the EVL protein, which is believed to reduce the ability of estrogen receptor-positive breast cancer to spread to other parts of the body. Padilla-Rodriguez examined the genetic data of the EVL protein (pronounced "evil"), and discovered it is an important inhibitor of the cancer cells' ability to spread. Estrogen receptor-positive tumors are covered with estrogen, and these estrogen cells can break free from their original tumor and spread elsewhere in the body. 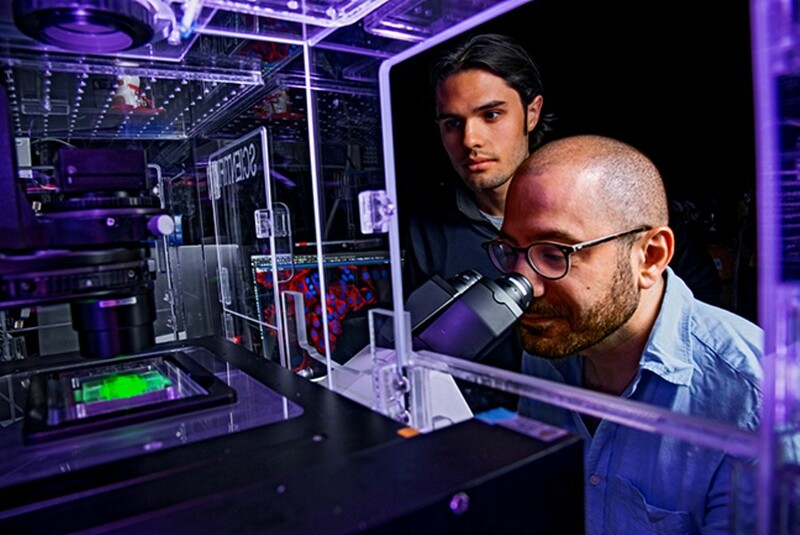 Padilla-Rodriguez, along with Dr. Ghassan Mouneimne, found the production of EVL can keep these cancer cells contained to the original tumor site. The doctors say their next step is learning how to focus EVL's interaction with estrogen to develop specialty treatments for patients with estrogen receptor-positive tumors. $2.5 Million Grant to Ease Cancer Patients' Distress. The National Cancer Institute gave a four-year, $2.5 million grant to UA's College of Nursing to investigate specialty approaches to decrease psychological distress in cancer patients and their families. This new approach is called a Sequential Multiple Assignment Randomized Trial (SMART). The project's principal investigator, Dr. Terry A. Badger, says while many treatment approaches are the same for all patients, SMART takes a more individualized approach, assessing the individual needs of cancer patients. SMART involves giving patients and caregivers telephone counselling calls in tandem with a specialty handbook to help manage elevated depression and anxiety. Badger says there is nothing wrong with face-to-face counselling appointments, but phone calls are more convenient for patients to receive the care they need. The American Cancer Society says roughly 30 percent of cancer patients suffer serious psychological depression, and the same percent of their caregivers also suffer these same negative effects. These numbers can be even higher in breast cancer patients. Treating "Triple-Negative" Breast Cancer. Triple-negative breast cancers lack three of the receptors treatment drugs usually target, greatly limiting patients' treatment options. But new options may be coming soon: A team led by UA Cancer Center researchers are examining drugs that could target triple-negative tumors, producing several new therapeutic options for this difficult-to-treat cancer. Currently, triple-negative patients are treated with radiation or chemotherapy, and lack options for more targeted forms of treatment. Researchers found about 20 to 30 percent of triple-negative breast cancers have lost the retinoblastoma (RB) tumor suppressor. They hypothesize focusing on the lost RB receptor may work as a target for new treatment drugs. Triple-negative breast tumors lacking the RB suppressor have increased levels of certain biomarkers. Developing drugs to target these biomarkers could be a strategy for treating the 20 to 30 percent of triple-negative patients who are unable to receive targeted treatments. Soy to Fight Cancer. Teams from the UA Cancer Center and College of Agriculture and Life Sciences joined forces to examine the anti-breast cancer properties of soy. Genistein, a compound found in soy foods, may protect "BRCA1," a gene that plays a pivotal role in inhibiting tumor development in breast tissue. BRCA1 genes can be suppressed by the aromatic hydrocarbon receptor (AhR). When BRCA1 is silenced by AhR, it is unable to carry out its duties as a tumor suppressor, and cancerous cells can thrive. Now knowing the tendencies of genistein, the team hopes genistein-based medicines can be made in the future to stop AhR from harming the cancer-fighting BRCA1.